While an ADA law enacted in January 2017 requires movie theaters to provide video description devices for their patrons with disabilities, the technology is still lacking. Visually impaired moviegoers have to rely on clunky, uncomfortable, and often complex devices (shown below). 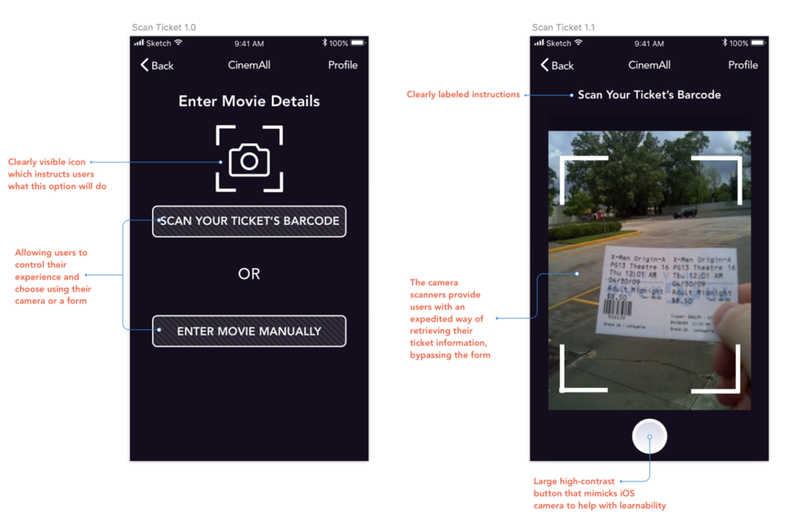 In an age when IMAX, Real 3D, CGI, VFX and other new technologies in movie theaters are prospering, and theaters are focusing on providing experiences beyond the movie itself (such as dine-in and bar services) why is it that users with visual impairments are often being forgotten? *For the purposes of our research we define the visually impaired as those users who have moderate to severe visual impairment (Snellen visual acuity: 20/70 to 20/400 range)1 , possibly extending to profoundly visually impaired users that fall into the 20/500 - 20/1000 range. 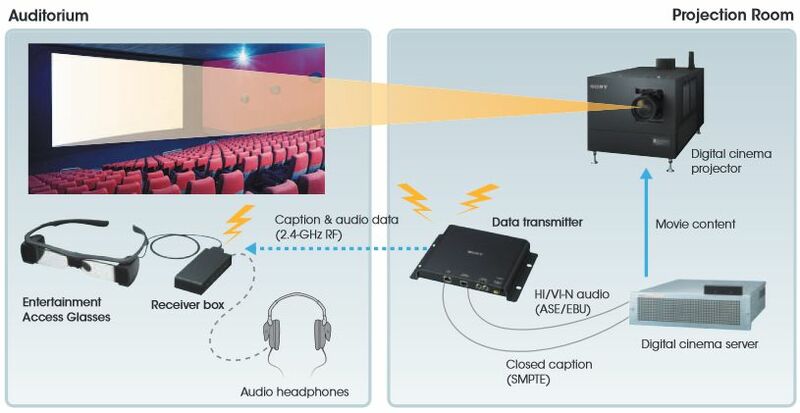 More precisely, this user group is defined as moviegoers or potential moviegoers who prefer to use a descriptive video devices when visiting a movie theater. We conducted 3 semi-structured interviews with the help of the Center for Visually Impaired (CVI) in Atlanta, as well as a physical walkthrough where one of our team members went to a theater and watched a movie using a descriptive video device. We also conducted literature review and dived into the online blind community by visiting government websites, existing solutions and user reviews of them, and online message boards such as reddit.com/r/blind. We gathered all the information from our research and conducted an affinity mapping session to visualize, categorize, and prioritize user needs. Now that we had defined the problem and identified the user needs, we still needed to decide what to build and why to build it. We sat down in an informed brainstorming session and collectively, we came up with over 60 ideas ranging from simple and easily implementable to outlandishly complex. The goal was to tap into our most creative ideas by exhausting as many options as possible. We then narrowed our scope by creating a Feasibility vs. Impact Chart. We chose this method so that we could find a solution that could both maximize benefits for the user, while keeping comfortable for providers in the hopes of encouraging them to adopt the solution. A kiosk that can automatically dispense the correct assistive video technology, while limiting interaction with undertrained staff. 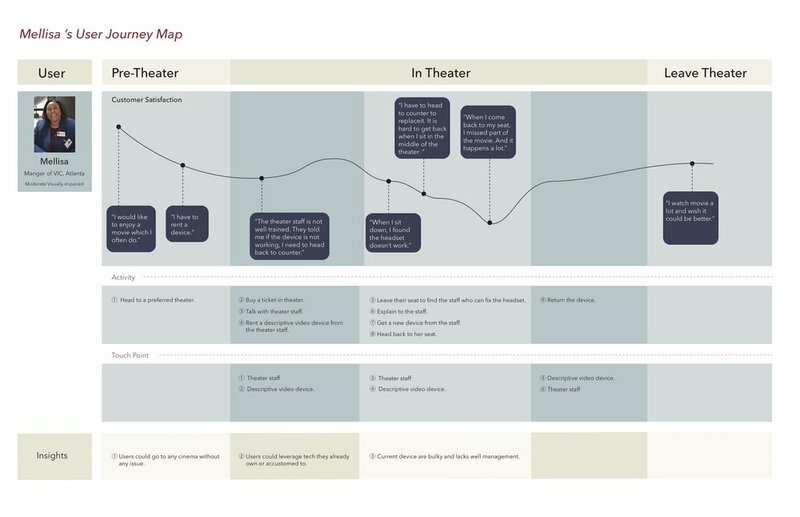 A mobile add, or addition to existing theater applications, that allows users to request accessibility devices prior to arriving to the theater, saving them time. 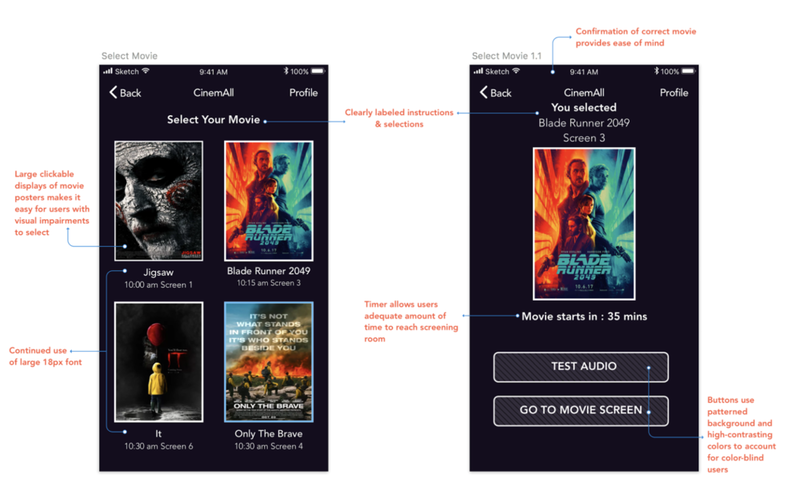 An app that automatically syncs the descriptive audio from the movie directly to the user’s phone, eliminating the need of clunky devices, cutting out interaction with undertrained staff, and saving time at the theater. After creating low-fi paper prototypes of our design alternatives, we demoed these to both our classmates as well as experts at the Center for the Visually Impaired (CVI) in Atlanta, who reassured us that smartphones with screen-reading functionality is used often by the visually impaired. We decided to move ahead with idea #3 — the in theater Audio Streaming App. First we had to choose the fidelity of the prototype. We needed the fidelity to be high enough, that users could get feedback from the interactive elements. We also had to constantly keep in mind that we were designing for a special population. This would come to affect everything from the colors we used, to the font size, and everything in between. 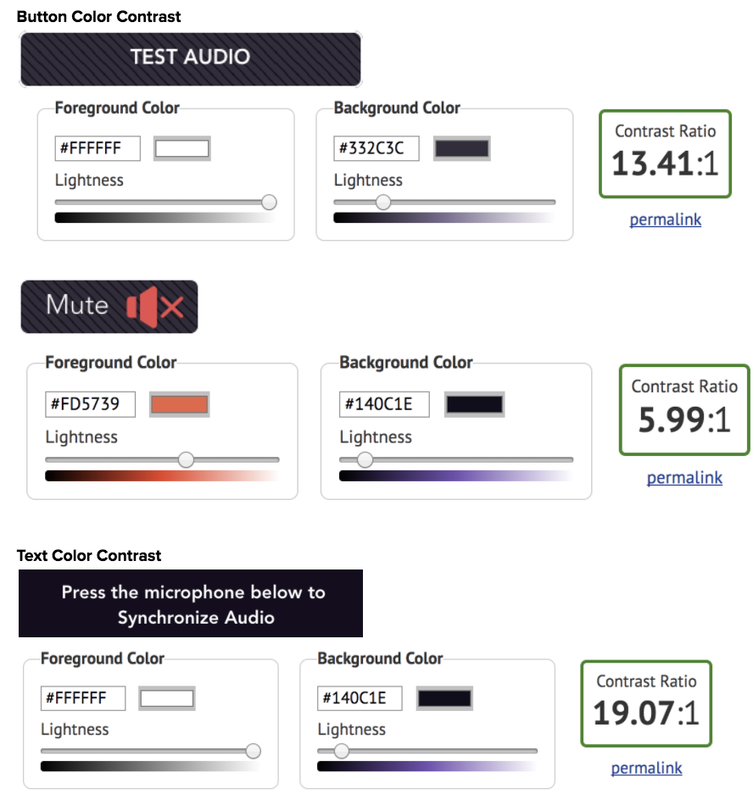 Because our users are visually impaired, we did some preliminary testing to confirm that our colors and contrasts meet widely-accepted guidelines. We used the WebAIM web app to check our contrast ratios. We considered a 4.5:1 contrast ratio as passing based off of the W3 recommendations for accessibility. Red was used because it has the longest wavelength, and provides the least stress on the eye when switching between it and dark contexts. Additionally, we made sure to add patterned backgrounds to all clickable elements to double-encode the information so that users with poor color perception can easily distinguish different elements on the screens. Lastly, we made the text and buttons large to allow for user error when aiming, which might be more common among our users. Unfortunately, by this point we had exhausted our resources at the Center for the Visually impaired, so we had to get a bit creative with our user testing. We had users with otherwise normal vision use our prototype while wearing vision impairing glasses. We used a combination of SUS Scales, Post-Task Questionnaire, and Benchmark Tasks to measure our app’s usability. Below is our user feedback overlayed on our user flow chart. When we embarked on this project, we were excited to design for a population we were unfamiliar with. We saw it as a challenge and knew we had to rigorously follow the design process in order to make sure we kept the best interests of these users in mind. However, designing for this population proved to be a challenge on multiple occasions. Design proved difficult and tedious because we had to be meticulous along every step of the way that our system met accessibility standards for various types of visual impairments. We should have leveraged more participatory design methods allowing the users to have been part of the process during every step of the way, not just in the interview and evaluation phases. It might take more time to design this way, but would be a better way to approach this particular situation.